The freedom of the West is protected by an extraordinary group of people who must leave their families to fight against various vile tyrants and totalitarians in foreign lands, not knowing if they will ever see their families again. Everyone in the West should pay tribute not only to them but to their families who also suffer and sacrifice so much. A Soldier Comes Home by Greg Moore, April/May 2005 (and archive) - A soldier comes home to his boys. "I Need You", by Gabe Haugland, July 27, 2010. A soldier explains why he has to go. "Don't go Daddy. I need you." Soldiers come home to their families. A beautiful 3 year old girl sees her Daddy again. Daddy! Hi Daddy! I missed you! I love you!" Concert by Toby Keith in 2005. 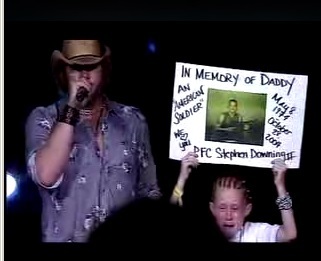 U.S. Army Private Stephen Downing, KIA in Iraq in 2004. The song is "American Soldier" (see official video). who has cerebral palsy, and whose father was KIA in Iraq. The money will be used for therapy to help her try to walk. 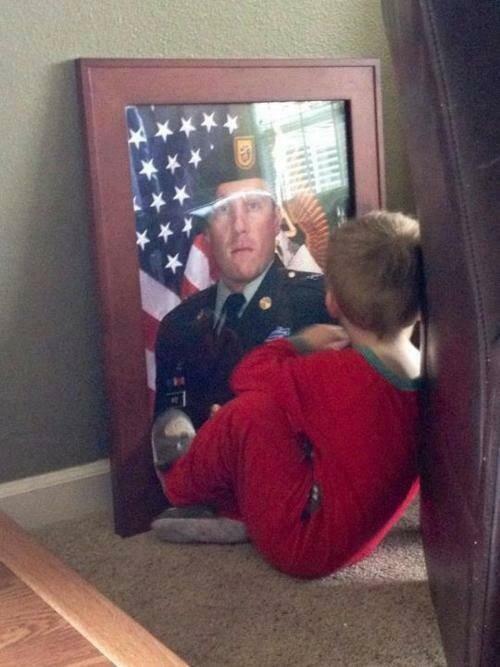 "I found my son sitting having a moment with his daddy (SFC Benjamin Wise) the other day. We lost him January 15 in Afghanistan". Luke Wise curls up in a corner with a picture of his father.